When I started making handwriting jewelry, I began a desperate hunt to find my grandma's handwriting. My Aunt Sylvia has a pile of sappy love letters my grandpa wrote to my grandma when he was 19, but no one could find anything with my grandma's beautiful handwriting. Then on Richard's birthday, I pulled out the Holly Hobbie Cookbook my grandma gave me the summer I turned 12. In its pages is what has become a family favorite recipe; Purrfect Pudding, a magical creation where the dry top layer becomes cake while baking, and the bottom layer turns into a luscious lava like pudding. I make it for Richard's birthday every year at his request. I usually open the book straight to the cake recipe. A couple years ago, I opened the front cover and found my grandma's handwriting! Imagine my delight... it had been right at my finger tips all along! 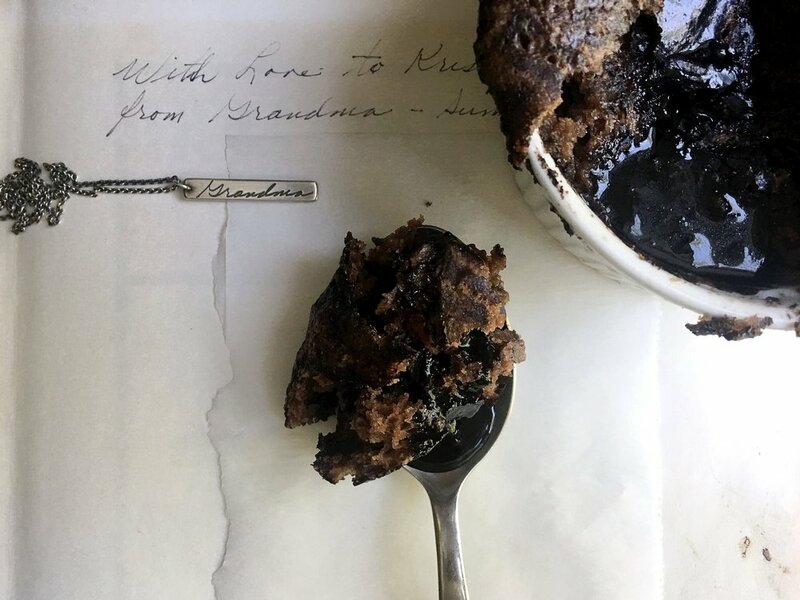 That is when the real magic happened, when I finally preserved her handwriting and created treasured necklaces for my mom and I.
I'm happy to share this beloved recipe with you, and I'm even happier to create a future heirloom for you to keep for yourself or to give. 1. Preheat oven to 325° F. Grease baking dish. Set aside. 2. Bottom Layer. Place chocolate and butter in top of double boiler. Melt chocolate over medium heat. Stir frequently. 3. Measure out sugar, flour, baking powder, and salt. Sift into mixing bowl. 4. Add chocolate mixture to flour mixture. Add milk and vanilla. Mix well. 5. Pour into baking dish, or divide evenly into custard cups. Smooth out evenly with back of spoon. 6. Top Layer. Place in bowl- brown sugar, granulated sugar, cocoa. Mix throughly. 7. Sprinkle over top of ingredients in baking dish, or custard cups. 9. Remove from oven. Cool on rack, until slightly warm. Serve with milk. Treasured family handwriting necklaces. On the left, my grandma's handwriting preserved in a bar pendant, taken from the inside over of a cookbook from my childhood. On the multi charm necklace to the right, the handwriting of three generations hang from a 14k gold ring; my grandma's handwriting, my mom's, and mine. Who's handwriting would you preserve in a future heirloom?